I’m back for Part V of my jelly bean adventure. 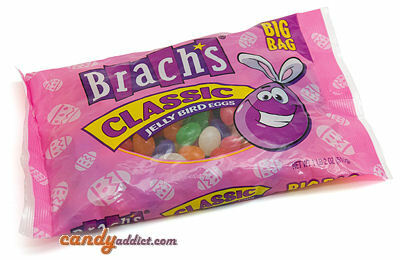 For some reason Brach’s calls their jelly beans “Classic Jelly Bird Eggs,” but to me they are jelly beans! 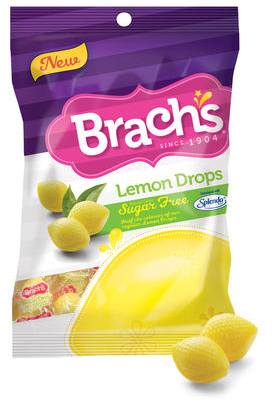 When I think of the jelly beans I ate as a kid, the Brach’s jelly beans are what I remember. In terms of flavor, these jelly beans are similar to the Necco jelly beans I reviewed a while back. If you’re looking for super sweet, chewy jelly beans, look no further. Don’t expect any tartness or realistic flavors – these jelly beans are all about the sugar. They’re artificially flavored, sugary goodness in all its glory. Continuing from where I left off, here is my next tasting of Brach’s penny candy products. This review focuses on the the fruit-flavored items they manufacture. Made with real juice for a fun, fruity flavor. These are similar to a Tootsie Roll Midgee, in terms of size and shape. Orange is reminiscent of sherbet. It has an incredibly soft chew, like biting into a marshmallow. The piece isnâ€™t sticky, but the flavor is muted, missing the zest a true orange flavor packs. Strawberry aims for the smell of ripe strawberries – it hits the mark spot on. The piece is chewier than the orange, but sill soft. Unfortunately, the strawberry flavor is not as evocative as the smell, further exacerbated by a waxy aftertaste. Grape makes my nose think of grape Bubble Tape when I unwrap it. The piece is the chewiest of them all, but still soft comparatively to other chews, like a really soft Starburst. The grape flavor is artificial, tasting exactly like the grape Bubble Tape. In fact, I completely forgot these were fruit chews and not gum until I noticed the pieces had dissolved in my mouth. My overall impression of these is that they are harmless, but avoiding providing any real substance; if there were a dish of these at a waiting room, people would only take a few.